A Natural History of Dragons is a book that defies categorization. It feels like a YA novel but is narrated by a married woman. With the presence of dragons, it is fantastical but models the culture of Victorian England so closely that it seems more like historical fiction. It is most definitely fictional, but is told in the style of a memoir. Isabella was not a normal Victorian era little girl. She is fascinated by animals. She devours complex scientific tomes on avian and dragon anatomy. She sneaks into dragon hunts. This is the type of behavior that must be squelched if you're going to fit in as a proper woman of that era. And squelched it is...for a time. This is such an odd book. As I said above, it's written as a memoir. Isabella has a dry, analytical voice. It makes the book feel stand-offish and slow paced. Yet at the same time, I had trouble putting it down. There really was no suspense and it was hard to become attached to the story or characters when the writing style kept me at arms length from the book. But I just had to keep reading. Perhaps because it's so different, it was compelling despite itself. A Natural History of Dragons is set at an unstated time in a made up country. But it mirrors Victorian era England (or maybe Scotland) so closely that I just assumed that's what it's meant to be. The setting later moves to a Russia-like country for a dragon hunt/excavation/research. Isabella is lucky to have good men in her life. It's a function of the time that she can't move up in the masculine world of dragon study without introduction by men. Her father is a kind, loving man who seeks to help his eccentric daughter find a husband who will allow her to live as she chooses. And she does. Her husband Jacob cherishes Isabella's intelligence and indulges her fascination with dragons. Isabella grows into a strong, confident adult. 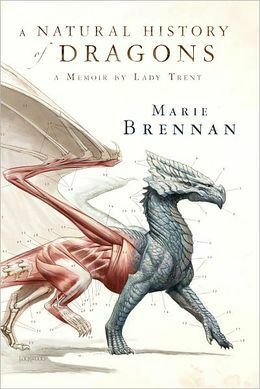 The book is about her transition from an overly privileged young woman who longs to gain entry as an equal in the world of dragon scientists to a woman who is at the top of her field, widely respected, and knows just how clever she is. At times, Isabella made me cringe, especially with how she treated her servants, but she was young and she'd been taught a "proper" way to manage the "help." As the events of the book unfolded, I was pleased to see Isabella becoming more flexible. A Natural History of Dragons is not precisely a pageturner. It has a plot but it's not overly compelling. But it is so different and written in a way that feels so real, that I got through it very quickly. If you're looking for something different, if you like historical fiction, if you like dragons, if you like memoirs, you will enjoy A Natural History of Dragons. I've been meaning to read this one but...haven't yet. Still, it sounds so very intriguing to me, written as if it were a factual book, set in an undisclosed timeframe. You've intrigued me! Now, I want to know if my thoughts on it would match up with yours! "Perhaps because it's so different, it was compelling despite itself." I actually really like the sound of that Alison! Sometimes a story's sheer uniqueness is enough to keep me interested, even if the plot and characters aren't reaching out and yanking me into the world. I haven't read much about this book, thanks so much for your wonderful review! Hmmmm I've heard very little about this one before, but you definitely make a strong case for it, Alison. I love that it seems to exceed even its own premise, which is definitely a strong suit to have. I might just have to give this one a go after all! I ordered this book for the library and I may have to check it out myself sometime. Another librarian highly recommended it. I don't know if it is a book I'd like (based on your review I have some reservations now) but I still want to give it a try. I agree that the writing style had a certain distance, which is weird considering it's a "memoir." I felt the same readability though, and I'm also not sure I can pinpoint why. I liked it though, and I liked how she did have such supportive men in her life. I've been really curious about this one. I think I'd enjoy the story a lot, but I'm not certain I'd have the patience to stick with it without breaks. I guess that's okay though, reading a bit here and there might be fine. I already have this one on my WL.